Krusinski Construction Company (KCC) is excited to announce the growth of our healthcare team. KCC is expanding its healthcare operations to provide solutions that support our client’s strategic initiatives. The continuing shift to value-based care in the healthcare marketplace has allowed Krusinski Construction Company to keep doing what it’s done for 44 years: leverage our experience and success by providing flexible and cost-effective solutions for our clients through diligence and partnership. 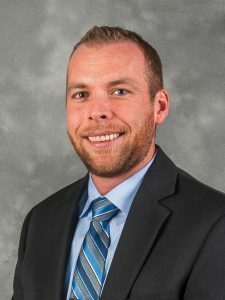 Krusinski Construction Company welcomes David Paulaskas, CHC, CHFM, as Project Executive. David brings over 20 years of experience in the design and construction industries. In his role, Paulaskas will continue to develop the firm’s healthcare portfolio and strategic opportunities. Salvatore Natale joins the team as Senior Superintendent. He will tap his 30 years of healthcare and commercial experience to continually improve the firm’s healthcare safety practices and field methods. Sal is responsible for managing the field operations on medical and specialty care projects. Some of KCC’s noted healthcare projects include: Shirley Ryan AbilityLab Outpatient and Day Rehab Centers in Burr Ridge and Glenview; Lurie Children’s at Northwestern Medicine – Delnor Hospital Pediatric Outpatient Center; Pronger Smith Medical Care; Advocate Sherman Outpatient Center; Children’s Physician Group, Children’s Hospital of Wisconsin; and Little Company of Mary Immediate Care Facility. Congratulations to the Chamber’s Vice Chairman Dan Wagner! What an amazing accomplishment! The real estate community gathered at the 134th Annual Inaugural Gala on Monday, October 9, for a beautiful evening at the Radisson Blu Aqua Hotel honoring members of the Chicago REALTOR® family. The event included the installation of the Chicago Association of REALTORS® 2017-2018 Board of Directors, and honored several individuals for their contributions and positive influence on the industry, among which was the recipient of the REALTOR® of the Year award. Dan Wagner’s vast and forever growing impact on the real estate industry and local community is admired and cherished by his fellow REALTORS®, Chicagoland citizens and colleagues at The Inland Real Estate Group of Companies, Inc. 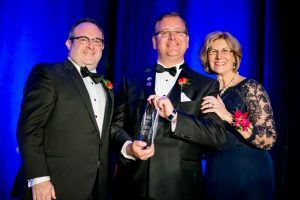 He served as the 2015-2016 President of the Chicago Association of REALTORS®, is the President-Elect of the Illinois REALTORS® and was the National Association of REALTORS®’ 2016 Commercial Liaison. He has been an outspoken advocate for protecting the 1031 Like-Kind Exchange and mortgage interest deduction. Dan possesses a determination to continue to make a positive impact on the real estate industry, year after year. Dan’s personal advocacy is just as admirable as his professional work. 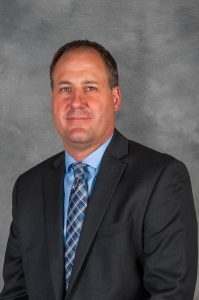 He is the Past Chairman of the Greater Oak Brook Chamber of Commerce, is actively involved with the Village of Oak Brook and is a commissioner on the DuPage Airport Authority. In 2014, he received the Advocacy Award from the Illinois Parks and Recreation Association for his work on behalf of special needs children in his community. 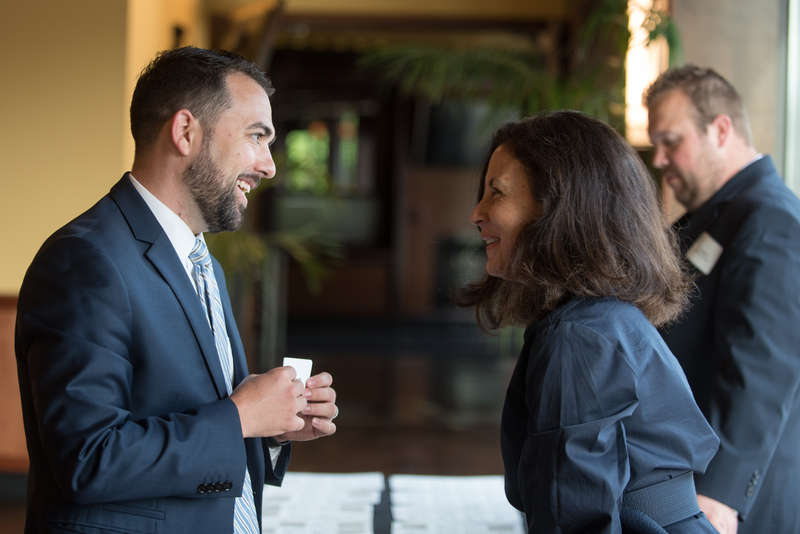 Dan’s passion and integrity bring positive change to every organization he is involved in, and he sets a well-respected standard for the Chicago Association of REALTORS®. We are extremely grateful to have Dan so heavily involved in our association and are incredibly honored to be presenting this award to him this evening. First you leave the city for a kid, a garage, and a backyard. Then you get a job in an office park-only maybe it’s an office park with yoga and food trucks. For millennials, the suburbs are the new city, and employers chasing young talent are starting to look at them anew. Many employers, hoping to attract millennials as they age, are trying to marry the best of urban and suburban life, choosing sites near public transit and walkable suburban main streets. “What’s desired downtown is being transferred to suburban environments to attract a suburban workforce,” said Scott Marshall, an executive managing director for investor leasing at CBRE Group. Marriott International’s recent search for a site to replace its old office park in the Washington suburb of Bethesda, Maryland, led it into not Washington but just across town, into Bethesda’s more transit-accessible downtown. Jim Young, Marriott’s vice president of corporate facilities, cites access to “some of the nation’s top public schools”-something more millennials will care more about as their kids get older. Suburban landlords are upgrading office parks with amenities to mimic urban life, too. At Van Vlissingen’s properties, that’s meant fitness centers, food-truck Fridays, beach volleyball courts, and a fire pit and amphitheater where monthly concerts are staged. Origin Investments, a real-estate investment firm, recently spruced up a dated office building outside Denver with a 4,000-square-foot fitness center and a “barista-driven” coffee lounge and stationed a rotating cast of food trucks outside a building it owns near Charlotte, North Carolina. Suburban office parks appeal because they’re cheap compared to downtown buildings, said Dave Welk, a managing director at Origin, which is based in Chicago. But his firm’s suburban thesis builds on the belief that city-loving millennials will eventually opt for suburban accoutrements. None of this means the suburbs will supplant central cities as job hubs. After all, jobs traditionally based in cities-jobs in professional industries as well as the service jobs that support them-are growing faster than those typically based outside of them, according to Jed Kolko, chief economist at Indeed. At the same time, Americans are more likely to live in the suburbs today than they were in 2000, and even the young, affluent ones drawn to cities tend to move once their kids reach school age, Kolko’s research shows. Many of those workers will suffer long commutes into the city center. Others will opt for jobs closer to their suburban homes. Jack Danilkowicz, 29, moved to Chicago in 2012 for a job at a financial job downtown, but within a few years, he married and started plotting his move to the suburbs. He landed a job at Horizon Pharma, a drugmaker with offices in the northern suburb of Lake Forest, and moved with his wife to nearby Libertyville, trading city night life for the good public schools their newborn son will one day attend. 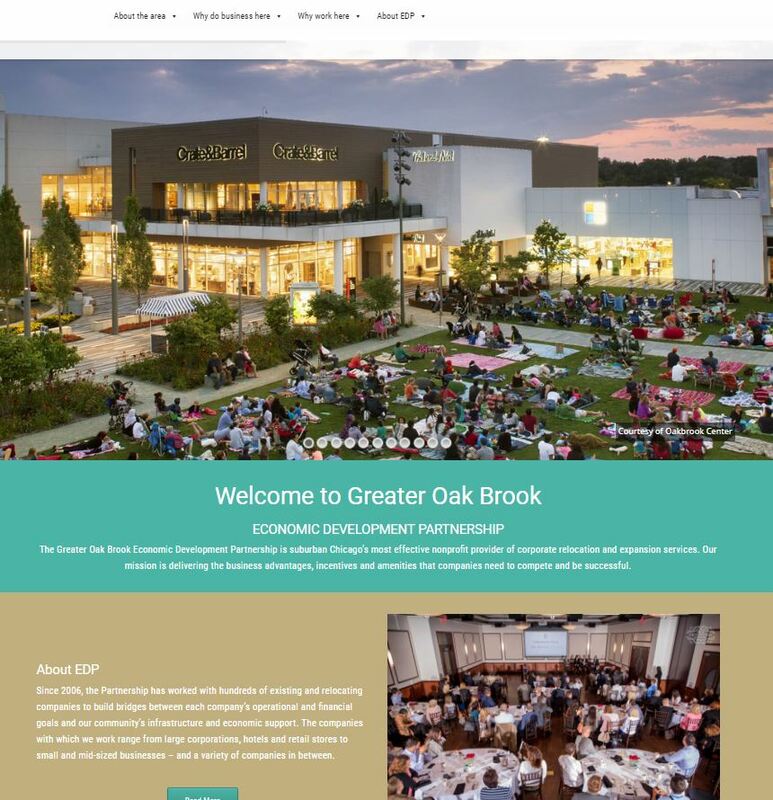 Keeping pace with the many exciting developments within the Oak Brook and Oakbrook Terrace areas will now be simpler with the launch of a new website for the Greater Oak Brook Economic Development Partnership. 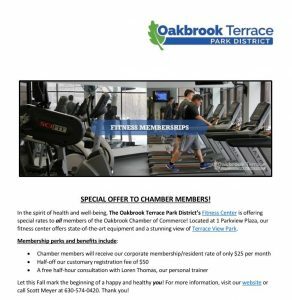 Developed in partnership with Xeno Media, a leading web agency headquartered in Oakbrook Terrace, Illinois, the new website will act as an attractive and engaging gateway for the​ ​Economic​ ​Development​ ​Partnership​, ​the​ ​Greater Oak Brook Chamber’s​ ​main​ ​strategic​ ​outreach​ ​tool for​ ​recruiting​ ​and retaining business​ ​and​ ​talent​ ​to​ ​the​ ​area. Of convenience to those seeking a new corporate location is a wide variety of essential information including information on the Partnership, Oak Brook and Oakbrook Terrace communities, regional tax rate comparisons, access and transportation, existing office and retail properties, workforce data, amenities and hospitality options, exciting economic development programming, and testimonials from business leaders in the area. Expanded Program and Additional Guest Speakers-Please Attend! 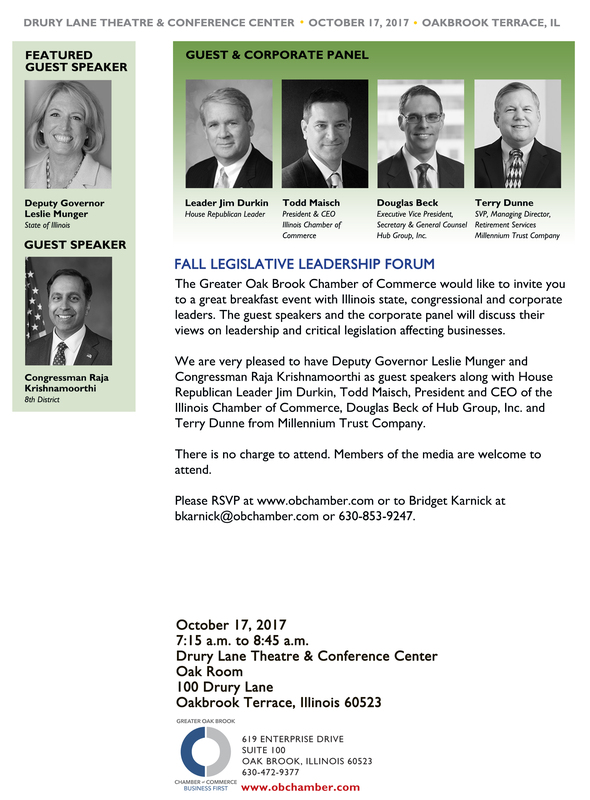 We are pleased to share that we have an expanded program and additional guest speakers confirmed for the Chamber’s Annual Legislative Leadership Forum on October 17, 2017. 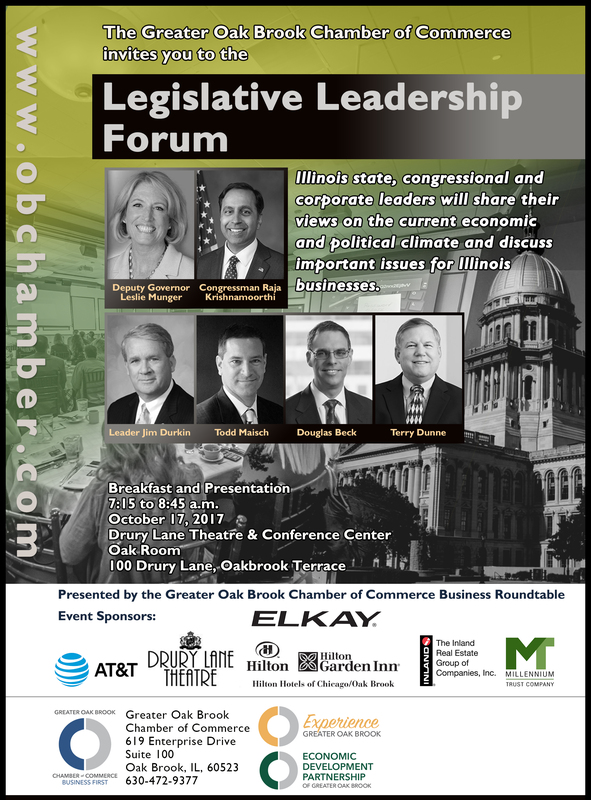 We are very honored to have Deputy Governor Leslie Munger and Congressman Raja Krishnamoorthi join the group of distinguished speakers for this event, which already include Republican Leader Jim Durkin, Illinois Chamber of Commerce President Todd Maisch, Douglas Beck of Hub Group, Inc. and Terry Dunne of Millennium Trust Company. Please, plan to attend this very important event. To follow, please find the invitation for the Legislative Leadership Forum. Please register as soon as possible at www.obchamber.com or with Bridget Karnick bkarnick@obchamber.com, 630-853-9247. We look forward to seeing you October 17! Planning a corporate event, meeting, luncheon, dinner, conference, retreat, outing or holiday party? Please join the Daily Herald Business Ledger as a guest at the 2017 DuPage Hospitality EXPO. The DuPage Hospitality EXPO has a wealth of facilities, resources and accommodations to meet any needs – large or small, business or personal. It’s free to attend – registration required. Don’t MISS the EXPO of the YEAR! Tickets are now on sale for DuPagePads’ most inspirational event, the 15th Annual Wake Up Your Spirit Breakfast. This year’s breakfast will take place on Wednesday, November 8th at Benedictine University in Lisle from 7:00-8:30am. The entire community is invited to begin their day with this truly uplifting event! Carol Simler, President & CEO of DuPagePads will highlight new developments and the agency’s vision for the future. 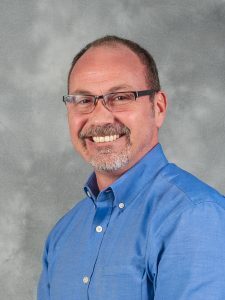 A DuPagePads’ participant will share their journey with the audience and keynote speaker, Eric Soderholm, will complete the exhilarating program. 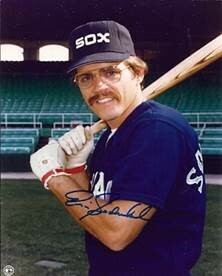 Eric Soderholm is a former Chicago White Sox third baseman and Sporting News 1977’s “American League Comeback Player of the Year.” Soderholm will share how his life has changed since his baseball days. Come hear his inspiring story at this year’s Wake Up Your Spirit Breakfast. “We are thrilled to have Eric Soderholm as our keynote speaker. While at a crossroad in his life, he dared to follow a new passion. He can surely relate to our tagline: when someone believes in you, everything can change,” says Carol Simler, DuPagePads President & CEO. Tickets are available for $40 per person on or before 10/20/17 and $45 per person after 10/20/17. Tables of 8 are also available for $320 per table on or before 10/20/17 and $360 per table after 10/20/17. To purchase tickets or to learn more about this event, please call DuPagePads at 630.682.3846 x2290 or visit www.dupagepads.org. Proceeds from the Wake Up Your Spirit Breakfast will provide crucial support services to families and individuals who are homeless as they work toward a place to call home. Please join us on November 8th and be part of the solution to end homelessness!